With the evolving hacking events around us, cyber-security skills are in high demand across all organizations and industries, because a shortage of skilled cyber security practitioners could leave an organization vulnerable to cyber attacks. But knowledge alone is not sufficient, 'certification as eligibility' also matters, which shows employers that you are serious about your career and eligible as you have demonstrated your technical ability in some form. I frequently receive emails and messages from my readers asking: Should I get certified?, Are certifications important to build up a career in IT?, What certifications can one get to start a career in information security? and more. These are some of the most frequent queries I came across, and in this article, I will attempt to answer these along with a solution on how to get started. Whether you are looking to launch your career in the IT industry, or perhaps get promoted at your current job — getting certified is a great way to market yourself. Certifications play a major role in any industry, as almost every organization hires IT professionals with practical knowledge as well as professional certifications which provide a measurement of your skills and knowledge. This is why it's important to earn certificates in your field. Cybrary, one of the most popular and highly rated free online IT and Cyber Security Training company, has recently launched around 80 Cyber Security Micro Courses and Certifications in an effort to combat the global shortage of talent in the cyber security profession. 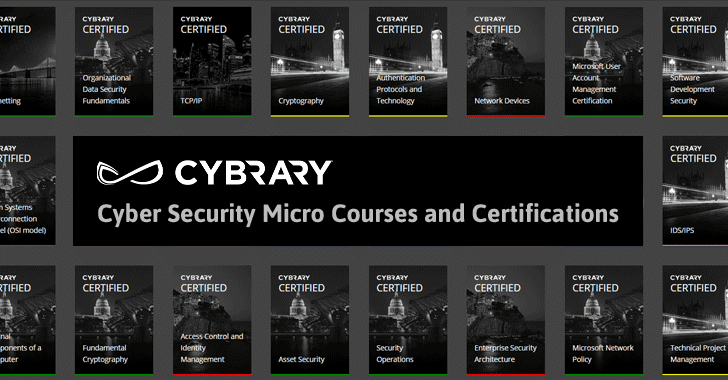 Created by the Cybrary Education Committee, all Micro Courses and Certifications are categorized into Beginner, Intermediate and Advanced levels, giving users thorough deep dive into the most critical skills in the field. Usually one has to pay thousands of dollars for classes and then thousands for certification exams, but the good news is that all Cybrary's Micro Courses are free and Certification exams are conducted online at the cost of just $10 each — with one free retake per exam. "The Cybrary community is working to make cybersecurity training available to anyone who wants it, anywhere. Training should not be exclusive to those who can afford to pay $5,000 per class. The same applies to certifications," said Ryan Corey, co-founder, Cybrary. "Certifications are imperative to a cybersecurity career, and it’s important that we provide accessible and affordable education paths that will help reverse the growing need for skilled cybersecurity professionals." Cybrary also provides free practice tests, so that users can test their capabilities and then finally apply for the actual certification exams. So, go and grab the best certification courses in cyber security and network security that suit your requirements. The Hacker News readers can use code FREESCT1 for your first free certification exam.